It's my turn to host the Friday Focus at Frilly & Funkie this week, and I wanted to give you a quick tutorial showing you my very favorite technique using Distress Markers, which happens to be stamping with them onto Specialty Stamping Paper...a match made for the creative good I tell ya! 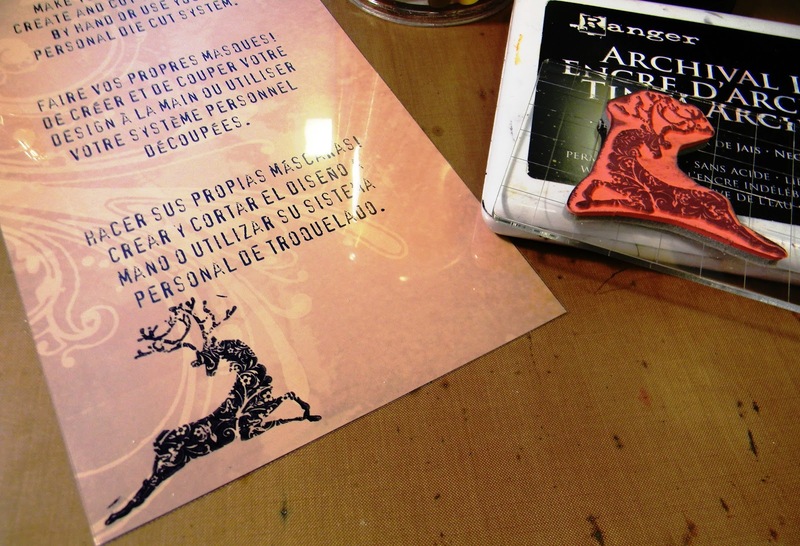 Have pieces of Ranger's Specialty Stamping Paper cut and ready, as well as stamps ready to go. I'm using images from Tim's Mini Holiday series. Using Distress Markers, color directly onto the leaping deer rubber stamp. 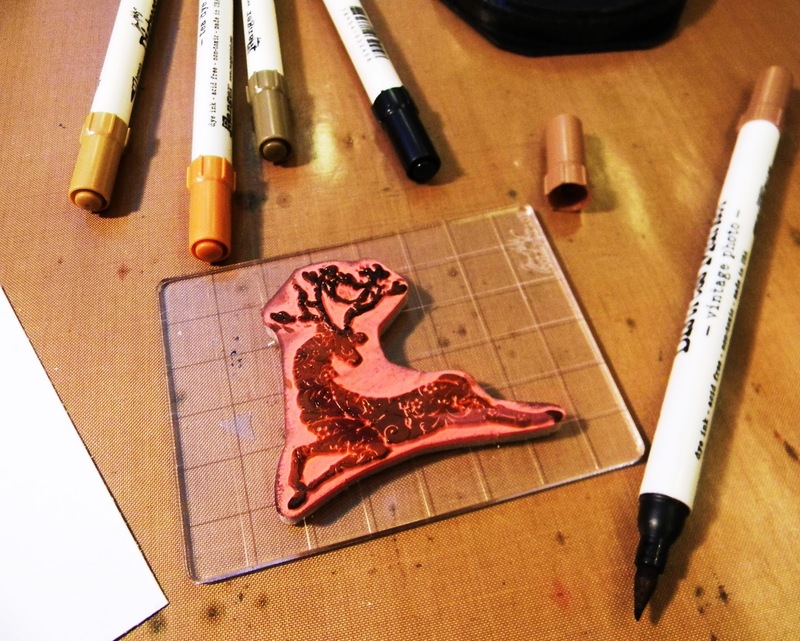 After brushing your teeth (hehehe)...Give your colored in stamp a good huff of breath. Here comes the cool part. Stamp your image onto the Specialty Stamping Paper. Give your stamp another huff of breath, and stamp the image again onto another piece of the paper. 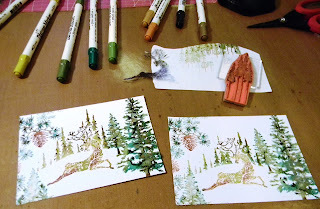 You can even repeat again...that is how color rich these markers are. 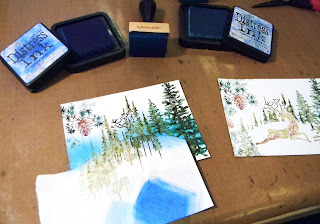 Even a light mist of water will make even the faintest hint of color on the stamp come alive and make for a wonderful watercolor effect. Cool huh? 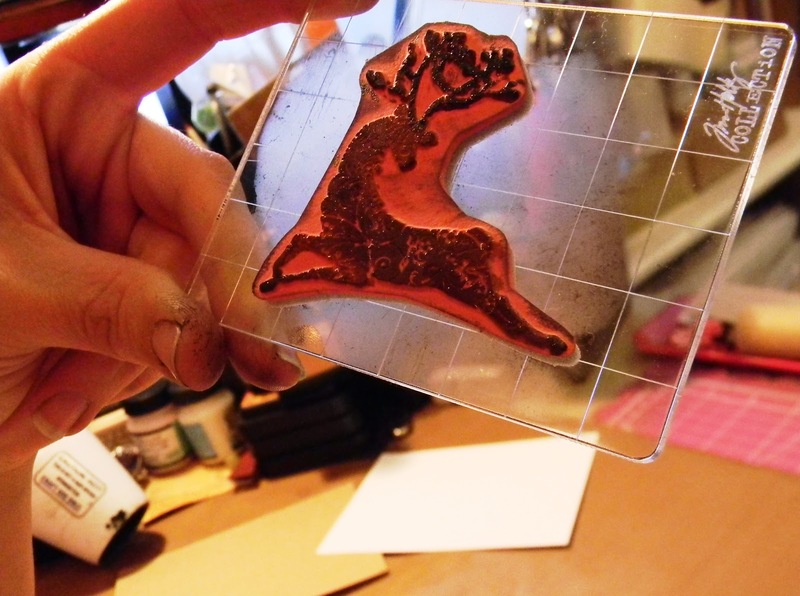 Always use a light blast from a heat tool after stamping onto Specialty Stamping Paper to set the color. 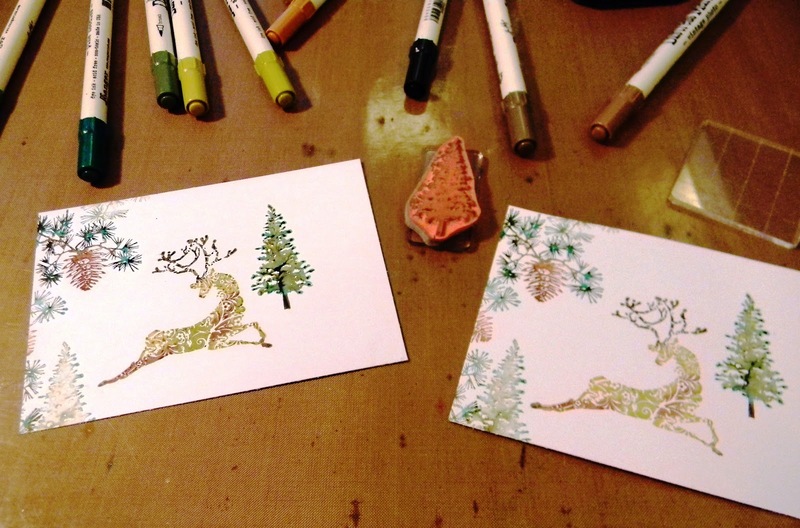 Repeat the coloring, huffing, and stamping again using the sprig and acorn image. 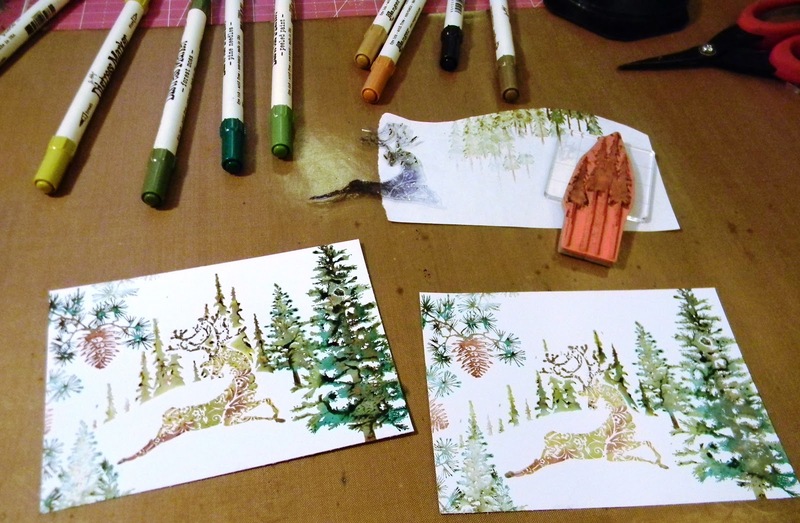 Keep stamping it around the main sprig until all color is gone. Repeat again using the mini tree image. 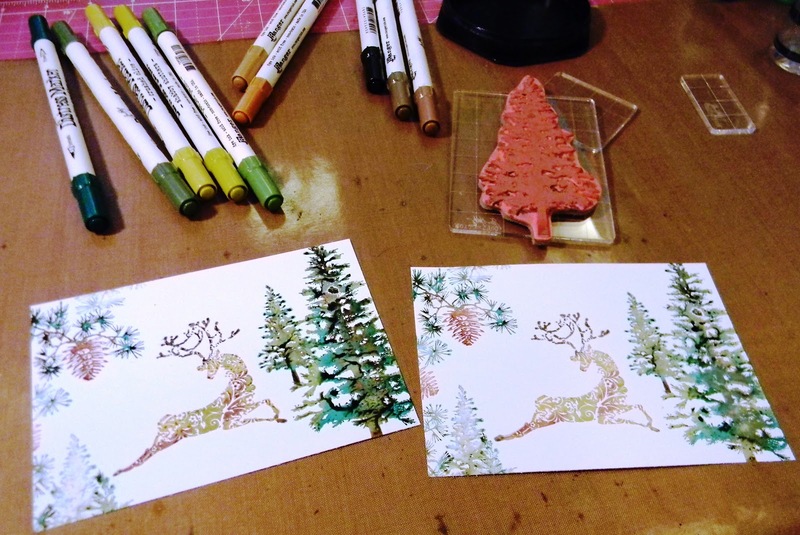 More coloring, huffing, and stamping using the large tree image. 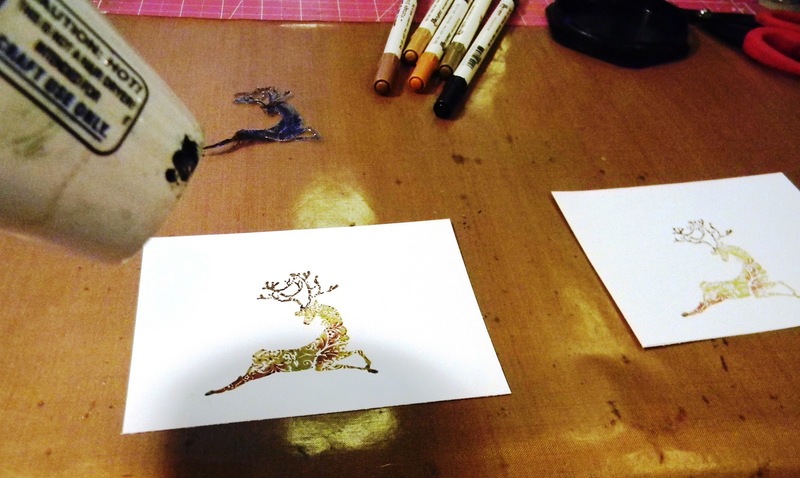 Using Jet Black Archival, stamp the leaping deer onto a piece of Idea-ology Masking Sheet. Dry and cut it out. Using a scrap sheet of paper, freehand cut a wave pattern to mimic a hill. 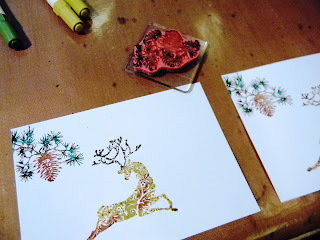 Apply the mask onto the stamped leaping deer and then apply the hilly scrap paper on top of the deer. 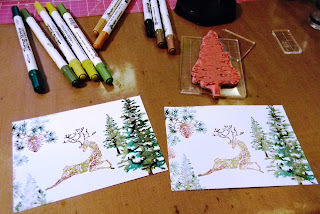 Color in the mini tree cluster image using the Distress Markers, huff on it, and stamp it onto the scene right where the scrap paper meets the Specialty Stamping Paper. Stamp it several times after huffing along the scene. 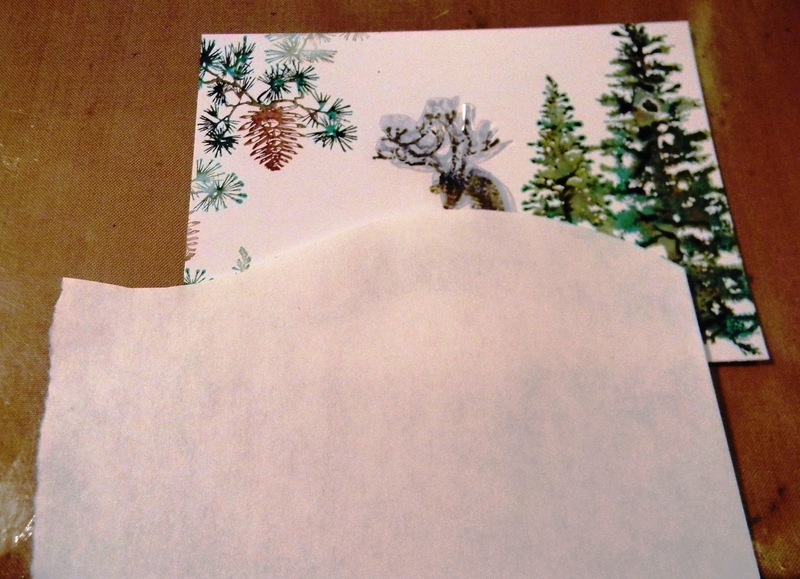 Remove the paper and mask and dry. Here is the coolest part. 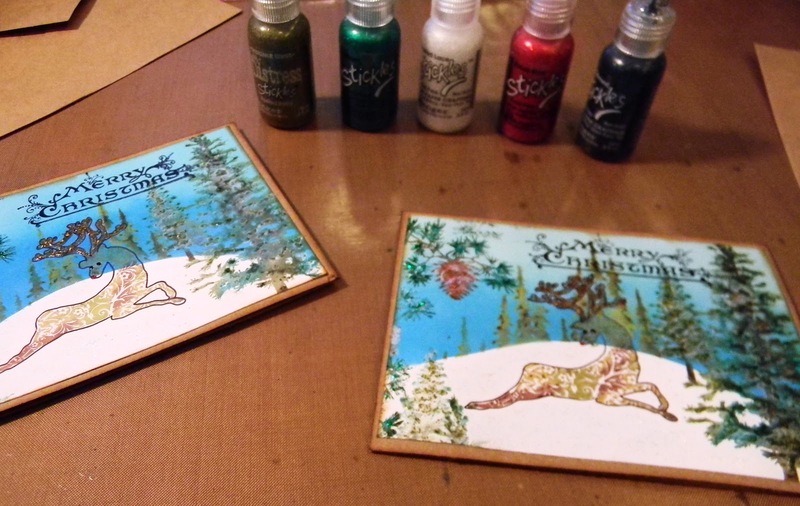 Apply the scrap back onto the scene where it matches up, and begin coloring in the sky portion with Distress Ink right over the Distress Marker images. 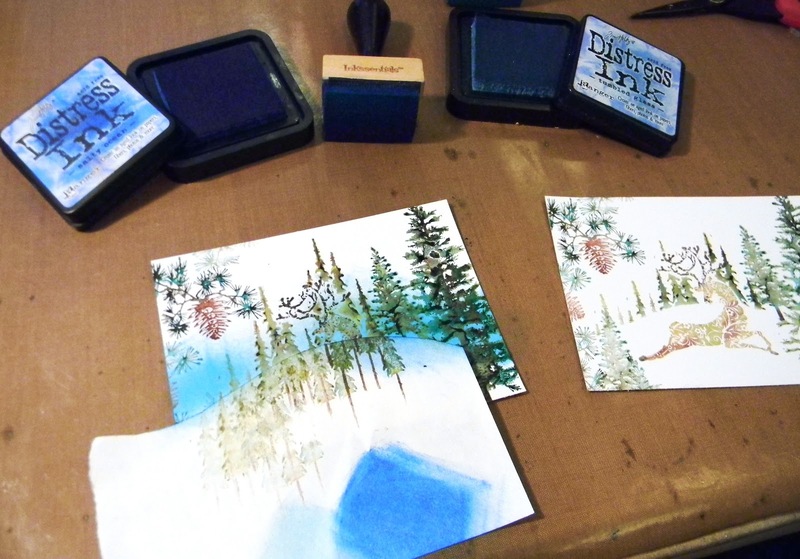 The Distress Markers resist the Distress Ink. I used Salty Ocean and Tumbled Glass for a graduated look to the sky. Using the Black Soot Marker, trace around the leaping deer image to make it really pop. Stamp a sentiment onto the top portion of the scene using Jet Black Archival. Ink the edges of the paper using Vintage Photo Distress Ink except the edge with the white portion. 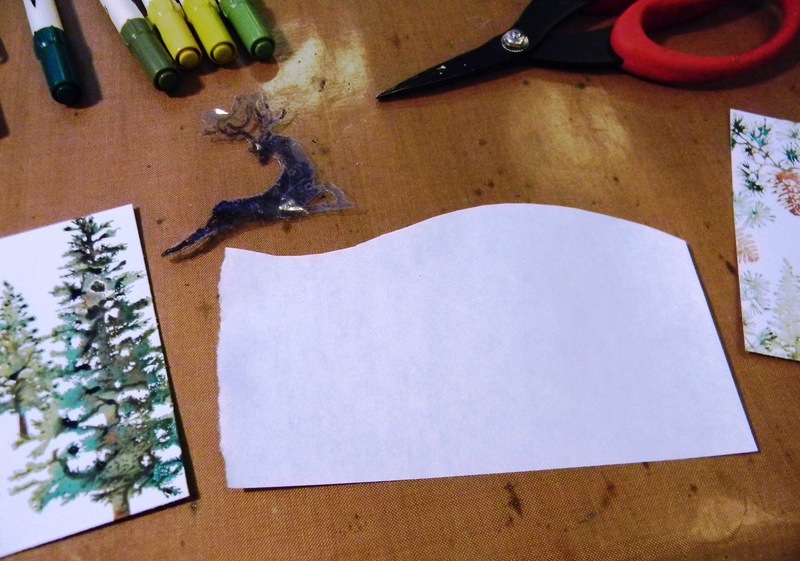 Adhere the paper scene onto a Kraft card. 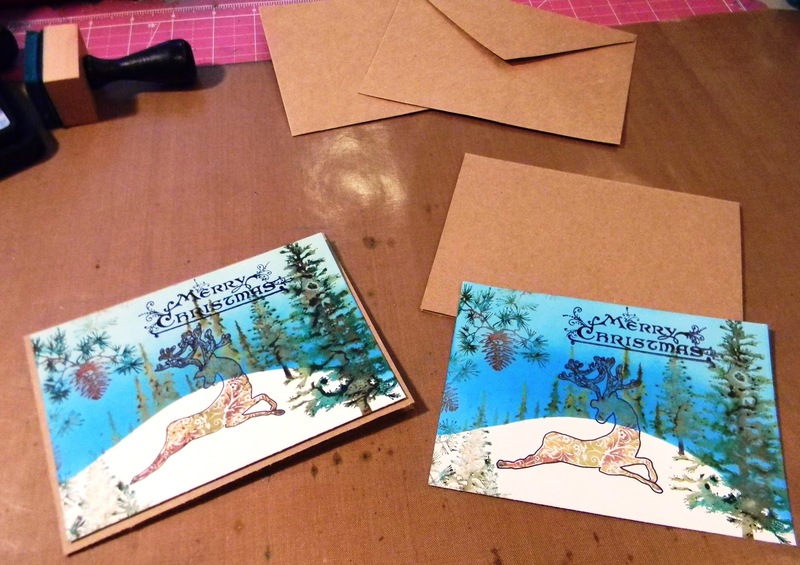 Ink the edges of the card as well with the vintage photo. Use Stickles to highlight parts of the scene for that special Christmas sparkle. What an amazing card Anita. I must get some time to give this a try. Oh my stars...that is just so perfectly winter! Fantastic cards!!! They are so beautiful and look like real especially christmas trees. 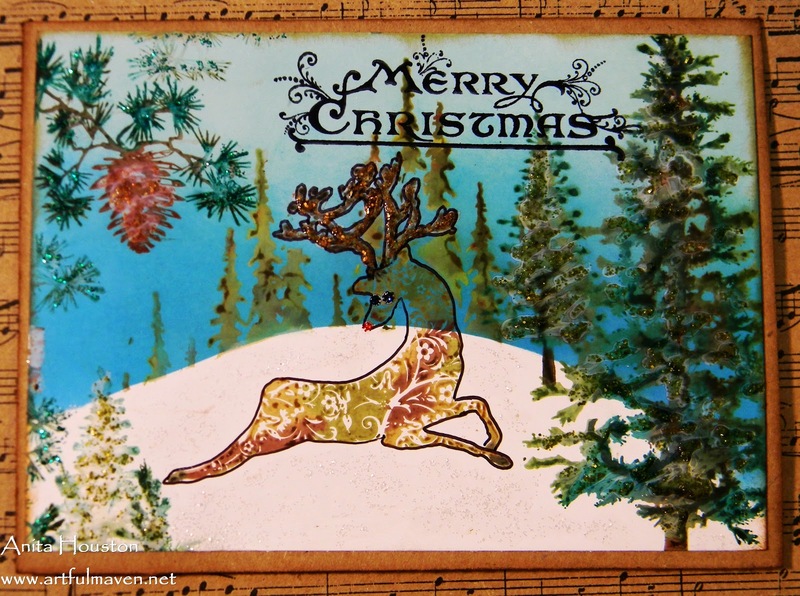 Reindeers are so gorgerous. I love colour of background and all elements. Absolutely exquisite colouring and stamping, Anita... those stamps are gorgeous too (more for the wishlist - aagh!!)... what a fantastic tutorial, and the the finished cards are like some gloriously illuminated manuscript - you're on a creative roll of genius!! This is so cool, Anita! I love that technique of masking and thanks for the reminder! 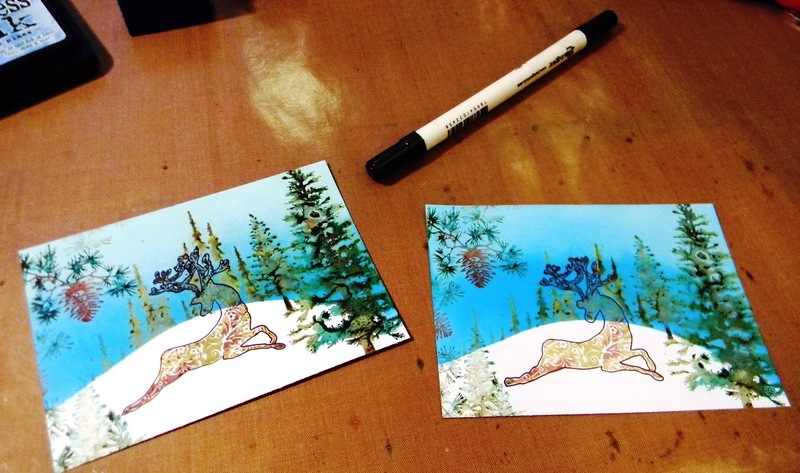 Such festive and lovely Christmas cards! Enjoy the weekend! Very nice! I love the way the images look so real in terms of distance! Gorgeous! Well, how cool is that!! I think those distress markers will have to go on my christmas wish list. Beautiful!! I also wanted to tell you that I re-opened my blog as I missed her too much!! 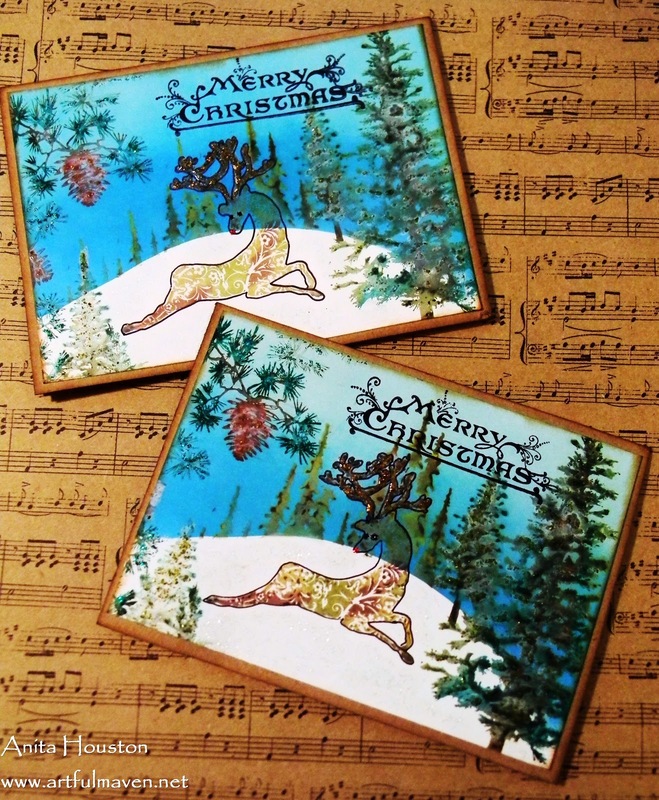 :) Merry Christmas! Are you a fan of the Man from Snowy River? lol! I thought of that when I saw your blog title. That is one of the BEST movies of all time. Your cards are fabulous Anita! Love the detail by coloring, really fantastic! Fantastic! Love this wintery scene and the way you nailed the proportions on the trees in the distance and foreground. 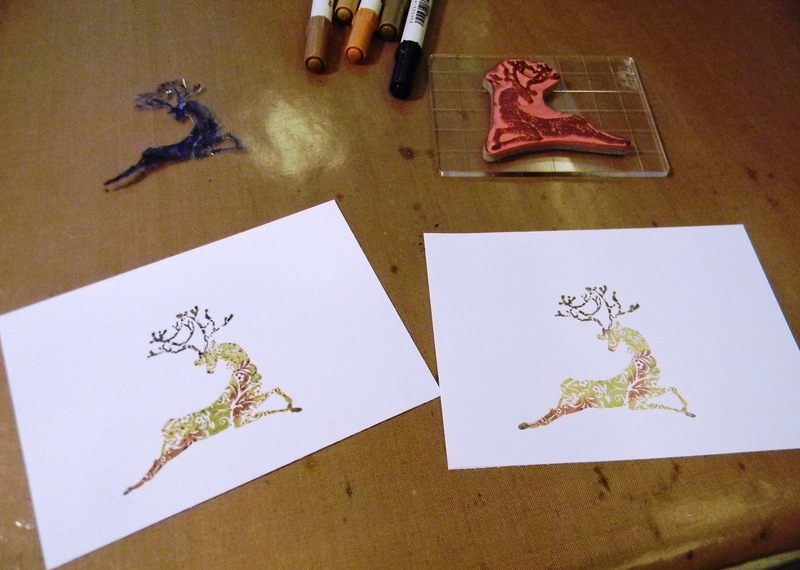 Really gorgeous reindeer, too!